Secure your IT rooms and fulfill regulatory requirements – avoid system outages before they occur! Secure your server room according to regulatory requirements and the international standard of the ISO27000 with our all-in-one monitoring system. Only one system monitors your entire IT infrastructure and detects more than 35 physical threats such as critical climate factors, fire or trespassing. Separate systems that are incompatible with each other and are generally associated with high costs are a thing of the past with Kentix. 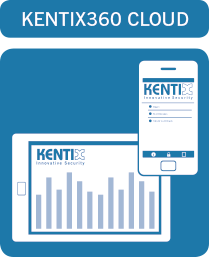 When connected to the KENTIX360 Cloud, you can even remote control your monitoring system from anywhere and at any time. The smart access control system Kentix DoorLock® offers effective protection against unauthorized access to your premises, even the distributed ones or across frontiers. It integrates Microsoft Active Directory (AD) and LDAP for easy access management from one central point. With its video recording function you can even capture picture sequences whenever a door is being opened or tampered with. 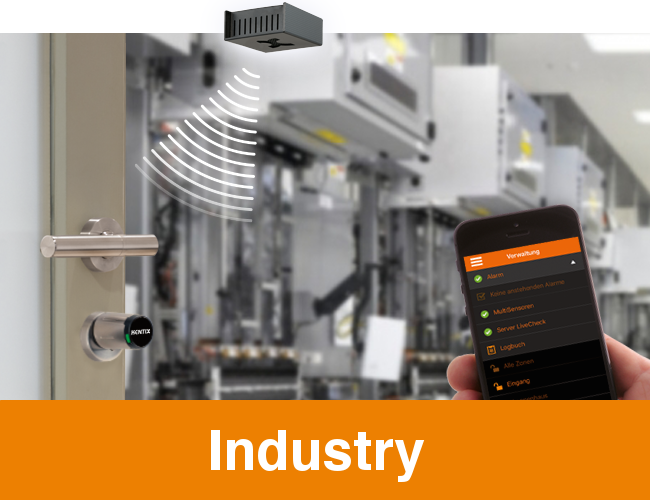 Moreover, the connection to the KENTIX360 Cloud allows remote control of the system from anywhere and any time. 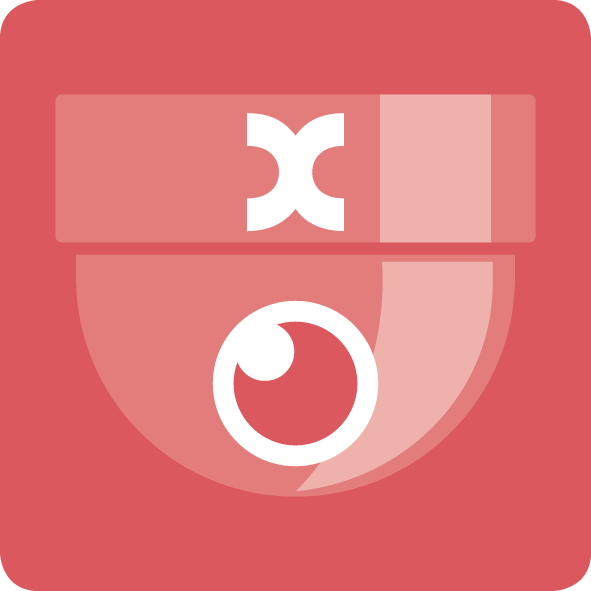 Kentix360 is a cloud-based security center to monitor your IT infrastructure. As an IT administrator you will get all the important information about the security state of your IT environment – anytime and anywhere. This way, you won’t have to worry about the status of your system and your IT infrastructure – and in case something does happen, Kentix informs you immediately and even if the company network is down so that you can react as quickly as possible and, at best, expensive outages can be avoided before they occur. Get to know our innovative novelties! Protection of building entrances and possibly other rooms in the building against unauthorized access with an online-compatible solution for the administration of authorizations, time-level-profiles and access logs. 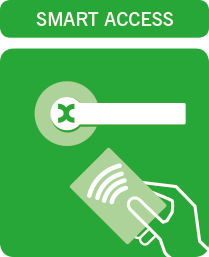 Doors are to be opened using RFID mediums in order to guarantee a user-related documentation each time. Authorizations can individually be granted or denied. If necessary, the solution ought to be expandable to other rooms or areas and be combinable with video surveillance. Protection of entrances and possibly other rooms in the building against unauthorized access with an online-compatible solution for the administration of authorizations, time-user-profiles and access logging. Doors are to be opened using RFID mediums so that user profiles will also be logged every time. Authorizations can be granted or denied individually. If required, the solution ought to be expandable to other rooms or areas and be combinable with video surveillance. Additionally, critical areas (entrance, rooms with limited access) ought to be monitored for burglary. In doing so, the access system takes over the entire control. Protection of non-public doors in or outside the building against non-authorized access across multiple branches. The administration of users and authorizations for single branches ought to be done centrally and integrate all sites into one system in order to keep the administration effort small. All access is documented in a central logbook. Additionally, critical areas are to be video controlled for an even higher level of security. as a hard-wired IP solution. Several branch locations with remote IT or engineering rooms. The rooms are connected to a central location via WAN and ought to be monitored completely. The monitoring ought to be done from a central location and integrate the single rooms on the sites into one system. 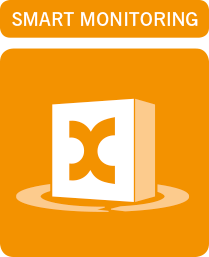 If required, the monitoring solution ought to be expandable in order to add video surveillance or to integrate rooms not related to IT for example. Absicherung von nicht-öffentlichen Türen am oder im Gebäude gegen unberechtigten Zutritt über mehrere Filialen hinweg. Die Verwaltung der Benutzer und Berechtigungen für die einzelnen Filialen soll dabei zentral erfolgen und alle Standorte zu einem System zusammenfassen, um den Administrationsaufwand klein zu halten. Alle Zutritte werden in einem zentralen Logbuch gespeichert. In kritischen Bereichen soll zusätzlich eine Videoanbindung erfolgen um diese besser zu überwachen. Monitoring in accordance with IT compliance of a standard server room with multiple IT cabinets, USV and climate system. The room ought to be monitored for all major physical threats such as over temperature, high humidity and more. 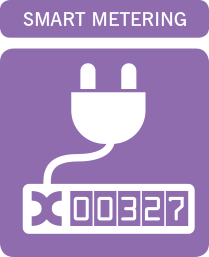 The monitoring system ought to be as simple as possible with manageable installing and investment efforts. Monitoring in accordance with IT compliance of a standard server room with multiple IT cabinets, USV and climate system. Additionally, there is another room with back-up systems, USV systems or other remote technology. The room s ought to be monitored for all major physical threats such as over temperature, high humidity and more. The monitoring system ought to be preferable simple, with manageable installing and investment efforts. IT rooms are distributed across multiple sites. Each site contains one or multiple rooms with IT cabinets, infrastructure and other technology all of which are to be fully monitored. The monitoring ought to be done from a central position and integrate all single areas into one system. If required, the monitoring solution ought to be expandable in order to integrate video surveillance or external sites for example. The monitoring is carried out be multiple sensors that are integrated into one central system. Adjoining engineering rooms also are to be monitored. The USV and climate control systems can be integrated via existing signal contacts. Additionally, the solution ought to offer interfaces for superordinate monitoring systems. Protection of one or more IT cabinets (server racks) against unauthorized access with an online-compatible solution for the administration of authorizations, time-level-profiles and access logs. Doors can be opened using RFID mediums so that a user-related log is created each time. Authorizations can individually be granted or denied. If required, the solution ought to be expandable to other rooms or areas and be combinable with video surveillance. You are the carrier or user of container or outdoor data centers in which systems with high availability requirements are operated? Physical security – meaning the protection of all affiliated devices against threats such as over temperature, high humidity, fire or burglary – is playing an important role for the permanent operation of servers and their surroundings. Potential threats must be detected as early as possible and at one glance in order to initiate countermeasures in time. The monitoring solution ought to be scalable. Additionally, interfaces for a superordinate network monitoring are to be available. with hard-wired wall-mounted IP readers. Your company has one or several IT- or technical rooms that are to be protected against unauthorized access. The administration of the accesses shall be realized with a fully IP-based solution. An opening of doors can take place using RFID-media, the input of a PIN- code or as a combination of both. All accesses are logged and are subject to the configured access profiles. The installation shall be designed as a fixed wiring without wireless or battery-powered components. Just contact us! We will be happy to discuss your requirements and make an individual offer..
Sie sind Betreiber bzw. Nutzer von Container- oder Outdoor-Rechenzentren in welchen Systeme mit Hochverfügbarkeits-Anforderungen betrieben werden. Physikalische Sicherheit – also die Absicherung aller verbauten Geräte gegen Gefahren wie Übertemperatur, hohe Luftfeuchtigkeit, Brand und Einbruch spielt hierbei eine wichtige Rolle für den dauerhaften Betrieb der Umgebung. Potentielle Gefahren sollen möglichst früh auf einen Blick identifizierbar sein, um Gegenmassnahmen einzuleiten. Die Überwachungslösung soll dabei möglichst skalierbar sein. Zusätzlich sollen Schnittstellen für ein übergeordnetes Network-Monitoring zur Verfügung stehen. Within the production facility, there are several engineering and supply rooms that are to be monitored. Physical security – meaning the protection of all affiliated devices against threats such as over temperature, high humidity, fire and burglary – plays an important role in the permanent operation of servers and their environment. Potential threats ought to be detected as soon as possible in order to initiate countermeasures in time. The monitoring itself ought to be done from a central position in order to be able to determine any critical conditions at a glance. Within the production facility there are IT cabinets which connect computer-controlled production lines to the server infrastructure for example. The cabinets ought to be monitored permanently for all critical threats such as over temperature or fire in order to secure the constant availability of the systems and thus guarantee an uninterrupted production. Potential risks ought to be detected as early as possible in order to initiate counter measures in time. The monitoring ought to be done from a central position so that critical conditions can directly be identified. Moreover, the solution ought to be scalable in order to be able to expand it if necessary. Protection of rooms inside the buildings as well as entrance doors against unauthorized access with an online-compatible solution for the administration of authorizations, time-level-profiles and access logs. Doors are to be opened using RFID mediums so that user-related access logs are created. Authorizations can individually be granted or denied. If required, the solution ought to be expandable to other rooms/areas and be combinable with video surveillance. Access control for distributed storage areas and material cabinets. There are several rooms or cabinets on site in which papers or materials for production or consumption materials are stored. An access control system ought to be installed in order to better control access and removal of material. The administration of user data and profiles ought to be done from a central position. All access is to be logged in a logbook. The affiliated components should be easy to maintain. Just contact us! We will be happy to discuss your requirements and make an individual offer. Absicherung von Lagerbereichen oder Materialschränken. Am Standort gibt es mehrere Räume oder Schränke, in denen Materialien für die Produktion, Unterlagen oder Verbrauchsmaterialien gelagert werden. Dort soll eine Zutrittskontrolle installiert werden, um Zugang und Entnahme von Materialien besser zu kontrollieren. Die Verwaltung von Benutzerdaten und Profilen soll von zentraler Stelle erfolgen. Alle Zutritte sind in einem zentralen Logbuch erfasst. Die verbauten Komponenten müssen möglichst einfach zu warten sein. We have answers! 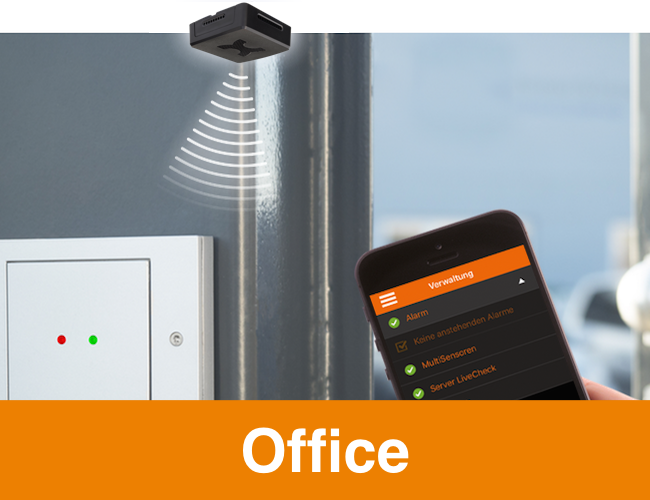 In a free and non-binding Live Online Demo, a Kentix employee will show you our 360° Smart Building Security solutions comfortably at your own desk. Visit the Kentix server room! 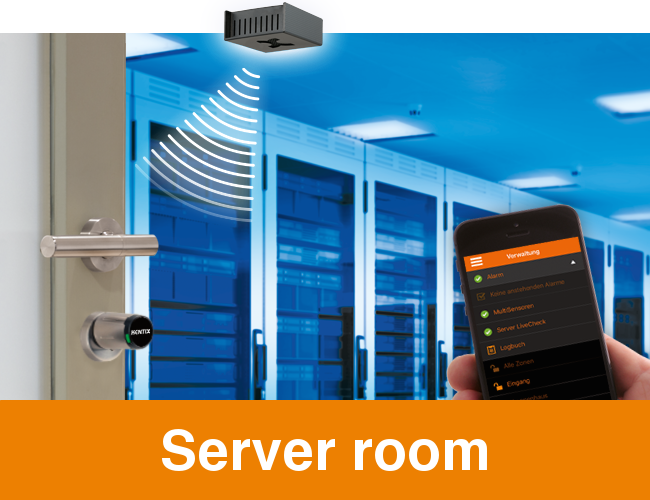 In our interactive server room you can see how ingeniously simple monitoring with Kentix is and how the individual products connect with each other.